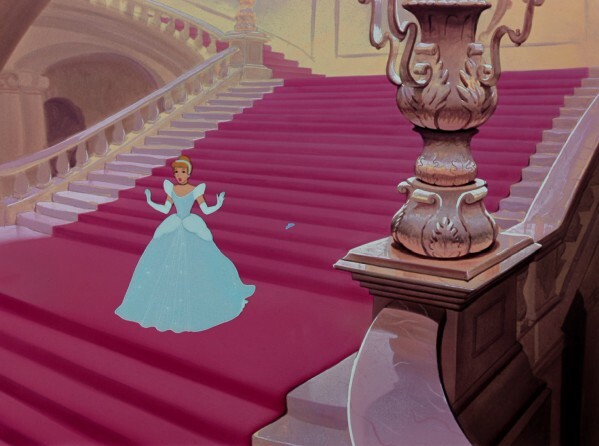 Cinderella has always been my favorite Disney Princess. Imagine a little Mel playing in her room (this is pre 3rd grade age) trying to tie my hair in the back like Cinderella; or wear an apron like Cinderella; or be graceful in my chores like Cinderella (laundry does NOT balance on the head). We had mice for a while. Yes…pet mice. I say “pet” because we named them…and although I never tried to talk to them or put clothes on them, we did play with them in our Barbie house. We tucked Porter (the male mouse) into bed in the Barbie house using a kleenex then got to playing and forgot about him. Thankfully, Porter had a little sputter (he was getting sick 😦 ) but that is the only way we ended up finding him. If you see me walk, one would note a few specifics: my right ankle curves dramatically inward when I step forward with my right foot; I wobble and sway in every direction; and when I turn corners, I usually end up meeting the wall first. Things as of late have been a bit more difficult, because without my left ear/hearing aid–my “regaining composure” sense is off. Meaning, when I walk my weak side is the right. My left leg and ankle take the weight of what the right is not doing. Most often this does not cause anything but if I go for long walks or exercise, I feel that weight immensely burden my left leg. But right now, that is not the case-more the balance is the problem. My left hearing aid is my strongest of the two. Going with no hearing aid in the left ear has caused more imbalance, especially when turning corners or walking in narrow hallways. But I still have seemed to pull off walking without falling completely. Which is huge! I mention the curve in my right foot for a specific reason. I have observed that over the past year this problem is increasing…yet might have several factors involved. My shoe is the slip-on shoe. Doesn’t matter what color or style, but as long as it is flat and can go on my foot without using strings or velcro to stay–then I consider them “slip-ons.” Slip-ons for me are like finding a solid pair of jeans: you wear them until they are no longer “wearable.” That might be the first factor. Then you add the curving of the right foot–it starts over time to smash the back left section of my shoe, hence, losing my grip of the foot in the shoe when I take a step. That is also a factor. And just for the record, yesterday was a bit chilly…I probably should not have been wearing slip-ons but it completed my “going out to the coffee shop” outfit. So that is my final factor: my shoes must go with my outfit. LOL. I was doing just fine in the early part of my errands before I went to the coffee shop. It was not until I was finding a parking solution that my right glass slipper became a problem. You got to admit–it seems that only on days like the one I will tell, is when the small town atmosphere seems awkward. Why? Because someone is bound to recognize you. At least in the city, I brush off these moments with the attitude, “Never going to see anyone here ever again anyway.” Not so with small towns. Oh well, I suppose. I found a spot on the street where there was a “No parking” in front of me and only one car behind me. Perfect! I hate parallel parking. So, I pull in and use the extra space in front of me to get up far so I can reverse and turn my wheels in closer to the curb. Getting out of the car, I realized that the hill is slanted so far to the right, I can hardly keep my door open and get out at the same time. There were no cars coming so I literally kick the door open and hold it with my left foot, grab my bag and get out of the car. As I make my way towards the coffee shop, I get to the barber’s and glance back. My parking was hardly on the line of the white box marks. I should have left it, but my OCD kicked in and I decide to go back and “recurve” my car in so I am closer to the curb. Getting out this time, I had to be more quick as cars and semi trucks came flying down the hill. I get my left foot out, and my right. My bag is on the front seat just within reach and I was about to make a grab-and-go for it when my right foot landed on the ground. COLD ground! I look down to see that my foot came out but not my shoe. By this time, I can’t open the car door until the light changed and so there I stood. My right arm holding the door open (but it looks like my arm is being smashed); my right shoeless foot trying to hide behind my left leg and loads of cars are stuck at a red light–eyes watching me just stand there. A green light could not have come any slower! I get to the table and sit. What a very ungraceful past twenty minutes! It was not until the car ride back home that I started finding humor in the story. I can’t imagine how I looked and I found that comical. Aristotle said, “The secret to humor is surprise.” I guess that gives my glass slipper moments of the day some grace; either that or I am still learning to give myself grace too, because ultimately, God reminds me of this grace through others–even strangers who are about to get soy chai spilled on their computer and still smile and say, “That’s ok.” That is grace. I think even the Duke experienced his own form of grace. The first glass slipper is broken (thanks to the step-mother’s cane) and he already let Cinderella escape the castle the first time. 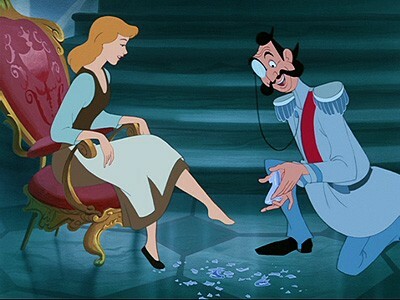 Worried what the king would do, Cinderella offers a little grace: the other glass slipper. So glad you can laugh at yourself and that you were not hurt (and did not spill your delicious chai)! Grace is not my middle name either if it makes you feel any better! Hey, BTW, thanks so much for the amazing tea and the yummy soup. You are so sweet! Love you! I’m glad you can laugh about your Cinderella story. Laughing is better than crying, because crying makes a big mess! Love ya’. HAHAHA – oh sis .. this made me laugh so so hard and yet gave me a fresh perspective on grace . I don’t know how you do it:) Love you so much! !